Moscow seems to be turning into a sort of political Mecca to where various political leaders are coming to discuss international issues. This is especially true for Arab leaders, who have not simply been regularly visiting Russia in the last six months, but consulted with Russia’s President Vladimir Putin on the phone as well. The recent visit of the uncooperative Emir of Qatar Tamim bin Hamad Al Thani to Moscow only aggravated this trend. Putin opened the meeting with a well-deserved rebuke: “We were waiting for your visit as early as last fall,” – he stated in a soft voice. Indeed, when all the monarchs of the Middle East were rushing to Russia last year, Qatar was in no hurry to take any steps, even though there’s a handful of issues that are to be discussed between the two countries, with some of them being fairly urgent. It should be noted that Qatar is one of the richest countries of the world. According to the IMF over the last couple of years it was far ahead of other states in such indicators as GDP per capita. Qatar occupies third place in the world in natural gas reserves, it’s world’s sixth exporter of natural gas and a major exporter of oil and oil products, which explains its membership in the Organization of the Petroleum Exporting Countries (OPEC). Since 1992, Qatar has been cooperating closely with the United States in terms of military cooperation. It is enough to note that the US chose to deploy the 609th Air and Space Operations Center to the Al Udeid Air Base in Qatar, as Washington doesn’t have many such centers as big or as important. 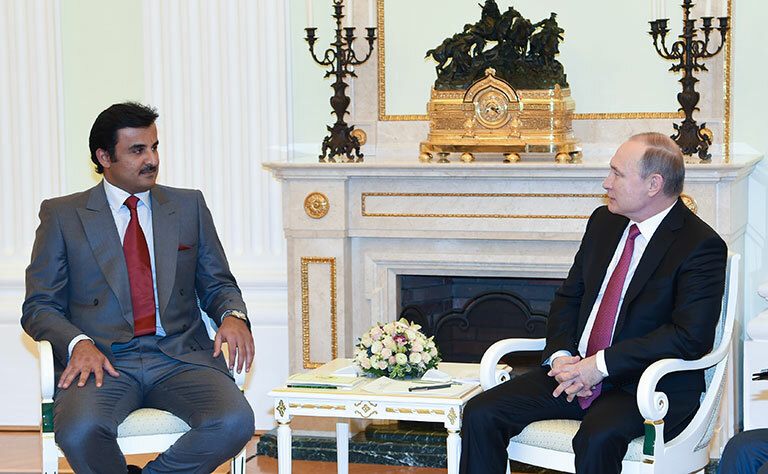 Quite naturally, Vladimir Putin announced to Sheikh Tamim bin Hamad Al Thani that in his opinion Qatar is one of the key components of the situation in the Middle East and the Gulf. The Russian President expressed his confidence that the efforts of the two countries to build relationships will serve as a sound foundation for further steps, while the visit of the Qatari Emir to Moscow will only strengthen the ties of bilateral cooperation. “Russia plays a main role when it comes to stability in the world,” noted Sheikh Tamim bin Hamad al-Thani, while adding that Qatar “wants to develop relations with Russia and find a solution to a number of problems related to stability in some countries of our region” — he added. Russia’s Foreign Minister Sergei Lavrov has openly announced at the press conference after the meeting that the parties discussed the situation in Syria, Yemen, and Palestine, while reaching an understanding of each other’s positions. He underlined that the two states will show maximum mutual efforts to improve the efficiency of anti-terrorist actions in the region. According to Sergei Lavrov, the leaders of Russia and Qatar agreed that, despite the serious ongoing crisis in the Arab World one shouldn’t forget about the Israeli-Palestinian conflict and the need to resume direct negotiations between Palestine and Israel within the existing international legal framework, which should allow Palestinians to establish their own state. 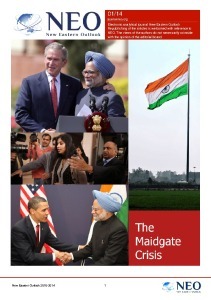 It is quite natural that one of the major points of bilateral negotiations was the ongoing Syrian conflict. 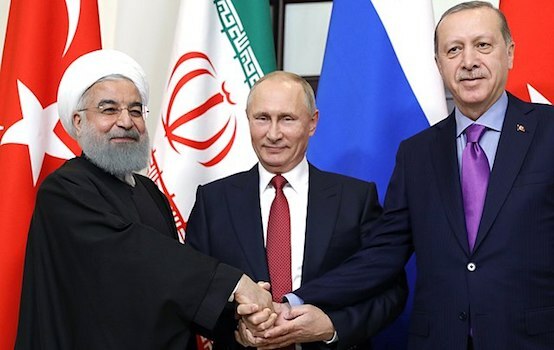 There’s been a number of serious differences in the positions of Russia and Qatar, as well as a number of other countries on the legitimacy of the sitting Syrian government, that stand in the way of a peaceful settlement. Earlier this month Russia’s Foreign Minister stated after the meeting with his Qatari counterpart Khalid bin Mohammed al-Attiyah that it’s about time to admit openly that one of the most sensitive issues in the Syrian settlement is the difference of opinions on the legitimacy of the sitting Syrian government, that exists between Russia, Qatar and a number of other countries. The Geneva communique stressed the need for reforms on the basis of universal consensus of the whole spectrum of Syrian society. Then, the Minister recalled that the West has refused to transform the communiqué in a UN resolution as the Russian Federation was proposing, “because there was not a single word about the need for regime change.” As a result, the political process has not started yet. To summarize the discussion that was held on Syria, there’s little substance behind the assurance of mutual cooperation in the fight against international terrorism, since the parties remained true to their positions. Russia, as it used to, insists on the peaceful solution to this bloody conflict, while underlying the Syrian people alone have the right to decide their own destiny and elect their own president. Qatar, whose leaders have lost track of the international situation due to their enormous incomes, want to decide the fate of Syria and its people themselves. It’s curious that a small Qatar with a population of only 350,000, and has been formed as an emirate for not more than 200 years and only receiving independence from the hands of British authorities in 1971, is trying to impose its will on nearly 20 million Syrians, while Syria’s civilization dates back to the 4th century B.C. Therefore regarding the forthcoming talks on Syria, Russia and Qatar will most likely defend different perspectives. Qatar hasn’t abandoned its ambitions to put an obedient puppet at the head of the Syrian state, therefore it doesn’t have any second thoughts when it provides funding to a variety of terrorist organizations, established with a single goal – to topple the legitimately elected President Bashar al-Assad. Well, who is going to replace him? Apparently, there we’re going to see some variation of a sealed train carrying “opposition members” from abroad, as had once been done with Lenin. However, many analysts predict that the only possible alternative to Bashar al-Assad is the brutal oppression imposed by the Islamic State. At least discussions on cooperation in such areas as energy markets, processing, mechanical engineering and agriculture look promising. As you know, Qatar is one of the major gas supplier, including LNG supplies. Earlier in December, it was reported that at a meeting between Russian Foreign Minister Sergei Lavrov and his Qatari counterpart Khalid bin Mohammad Al Attiyah, the parties reaffirmed their readiness to support each other in energy markets. Yet, Russia and Qatar present serious competition to each other as gas supplies are concerned, especially in Europe. It is possible that Qatar could offer some concessions in the harsh market rivalry in exchange for certain concessions from the Russian side. However, it is clear that these will largely depend on political issues. It should be recalled that back in 2013 the chairman of the board of directors Viktor Zubkov visited Qatar with the then Prime Minister, Minister of Foreign Affairs Sheikh Hamad Bin Jassim to discuss promising areas of Russian-Qatari cooperation in the gas industry, namely the implementation of joint projects in third countries in order to create new markets for natural gas. During his stay in Doha, Viktor Zubkov held the opening ceremony of the regional office of Gazprom. This office is fully operational now, and is working in cooperation with Qatar Petroleum, Qatargas, and Rasgaz. At a meeting with the Chairman of the State Duma, Sergey Naryshkin, the parties agreed that they would spare no effort to ensure that the FIFA World Cup will be held in Russia and Qatar in accordance with previous arrangements. This was told to the RIA Novosti agency by the head of the foreign-affairs committee of the State Duma, Alexei Pushkov, who was present at the meeting. As you must know, last year the Swiss police launched an investigation that is directly related to the vote given to Russia and Qatar to be host countries of the FIFA World Championships in 2018 and 2022 respectively in a bid to change vote results. While analyzing the results of the visit paid by the Emir of Qatar to Russia, most analysts agree that in recent years Russia has replaced the United States as a center where global issues are being discussed and resolved. And if one is to take into account that Russian leaders have always been faithful to the principles of peaceful resolution of all international issues, problems and disputes, this situation may be beneficial for all people across the globe.